Here are twelve exciting episodes of international intrigue from the golden age of radio. "Wherever there is mystery, adventure, intrigue, in all the strange and dangerous places in the world, there you will find the man called X!" Debonair British actor Herbert Marshall stars as FBI secret agent Ken Thurston, "the man who crosses the ocean as readily as you and I cross town; he is the man who fights today's war in his unique fashion, so that tomorrow's peace will make the world a neighborhood for all of us." Leon Belasco plays Mr. X's comedic sidekick, Pagan Zeldchmidt, who always turns up in remote parts of the world to assist Thurston. 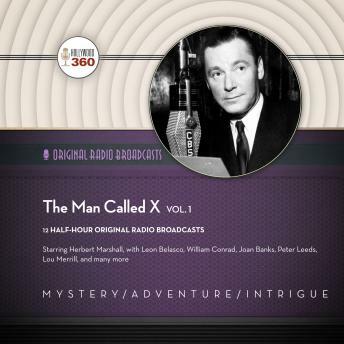 The Man Called X debuted over CBS radio on July 10, 1944, moved to NBC in 1950, and continued through May 20, 1952. In 1956 Ziv Television adapted The Man Called X as a thirty-nine-episode syndicated series starring Barry Sullivan as Ken Thurston.